The quest for gains is endless. Whether it be size, strength, power, or overall performance, the true athlete is never satisfied, constantly seeking to become bigger, stronger, and faster than before. Unfortunately, no matter how hard your train, how much you sleep, or how well you eat, each of us reach a point when the gains stop coming. 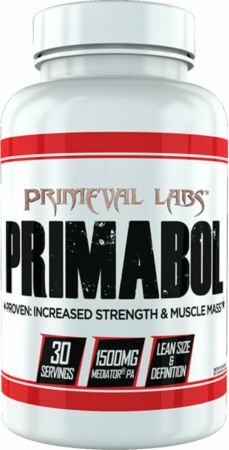 To help you break past those sticking points and shatter plateaus, Primeval Labs has created Primabol. A compound called phosphatidic acid. Most of you probably know that mTOR is the pathway driving protein synthesis and muscle growth. mTOR stands for mechanistic target of rapamycin and consists of a kinase that interfaces with other proteins to form one of two main complexes -- mTORC1 and mTORC2. mTORC1 plays a critical role in cell regulation, nutrient transport, and cell growth (including muscle cells). mTORC1 can be activated by a number of things including hormones, amino acids, and even exercise. When you exercise, muscle fibers are damaged when exposed to external loading. In response to this damage, an enzyme called phospholipase D senses this damage and produces phosphatidic acid. Primeval Labs uses the exact same form of phosphatidic acid, at the exact same dose, used in the clinical trials -- Mediator® Phosphatidic Acid. I'm usually a seriously hard gainer. This helped me at least get on par with what I assume is normal gain rate. It really helps a lot. 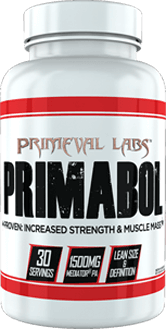 Directions For Primabol: As a dietary supplement take 6 capsules, once daily. Warnings: Read entire label and obtain clearance from a licensed healthcare practitioner before use. This product is to be used by healthy adults only. Do not use if you have or could develop any medical condition or are taking any prescription drugs. Do not use if you are pregnant, nursing, or may become pregnant. Do not use more than the recommended dosage. Discontinue use and consult a physician if any adverse reactions occur. Kepp lid tightly closed and in a cool, dry place. As with all supplements, KEEP OUT OF REACH OF CHILDREN AND ANIMALS.